Where Has God’s Love Gone? 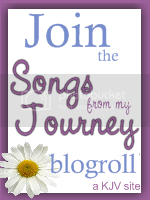 Welcome to my personal weblog! I have many areas of interest as a Christian wife and home schooling mother of 6 girls: writing, poetry, website design, digital photography, a home business (sewing); however, this blog will focus more on the wonderful journey the Lord has brought our family through and what the Lord has shown me in His Holy Word. I know that my devotionals don't often speak of specifics in our lives, but I want my readers to know that what I write comes most often from what the Lord is doing in our lives, or has done. I don't just repeat words by this preacher or that one. My devotionals are often written through a haze of tears, sometimes in grief, sometimes in peace at God's goodness for what He is doing for our good. At other times, after a flood of tears over my lack of faith in His great plan for us, especially after I've seen Heaven's gates open in another miraculous answer to prayer. What I write is what God shows me through those trials which He brings because of His great goodness as He works out His perfect plan. - Angela.